Please submit your information and we will generate your quote back. Questions? Call 1-800-638-9355. Sail Cloth Baffles are one in a family of sound baffle options offered by NetWell Noise Control. What makes the Sail Cloth Baffles unique is the ripstop nylon skin that the baffles are wrapped in. Available in 24 decorative colors, these acoustical baffles combine to lower the level of ambient echo in your room to deliver greater clarity back to the original sound and produce a more user-friendly space. These industrial sailcloth baffles measure 4’ wide x 2’ tall with grommets punched into the top two corners for vertical suspension from your ceiling. The goal with any acoustical baffle treatment is to capture and convert the echoes from your space. In turn, the level of background noise collapses, while premium sound quality is restored to your room. 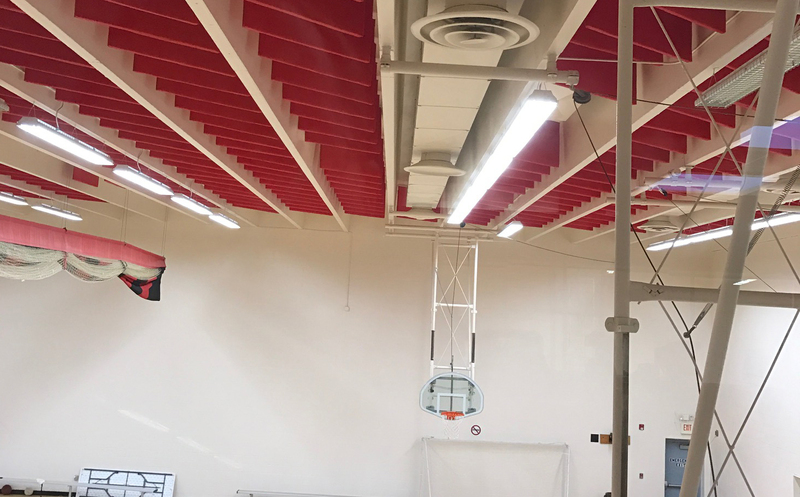 The key to the success of your sound baffle treatment lies not in where you position your baffles, but by ensuring that you get the right amount of baffle introduced into your space based on room size. Be sure to submit a Room Analysis so that we can accurately calculate your baffle count for you. Sail Cloth Baffles are priced at $60 each for a 4’ wide x 2’ tall x 2” thick sound baffle. 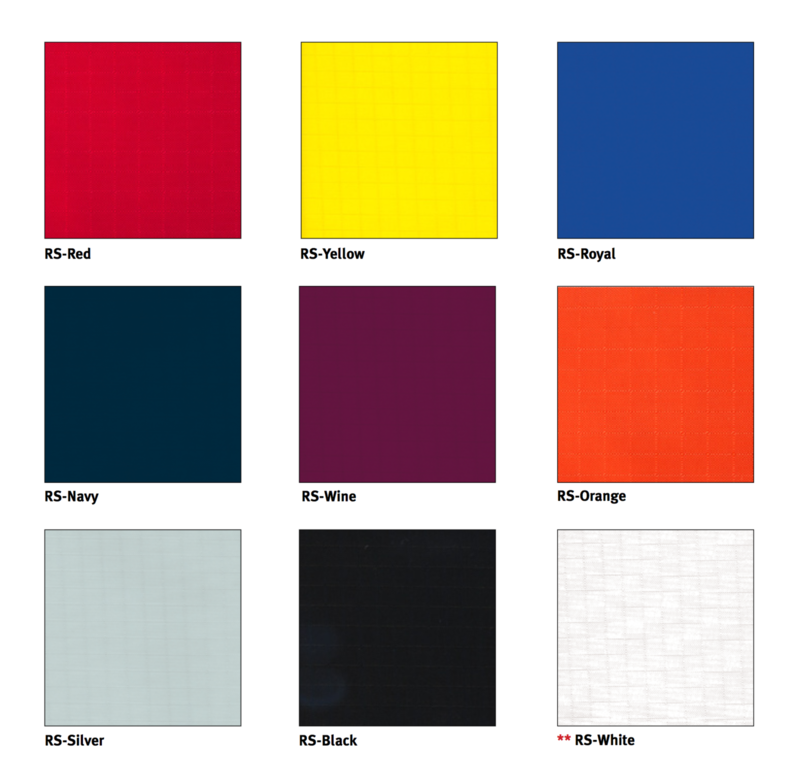 Choose from these 9 color options. Orders can be called into 1-800-638-9355 or placed online using the link to the left. 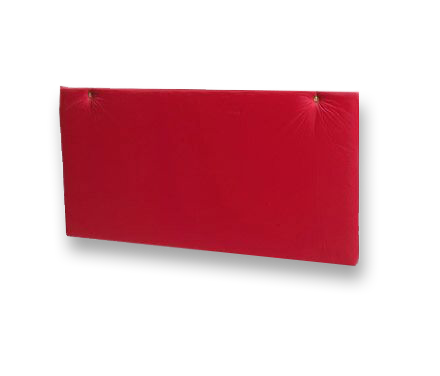 Our most popular sound baffle is the VET Baffle. Offered in 26 colors, and producing the same sound values back as the Sail Cloth baffle, the VET Baffle is half the price of the Sail Cloth Baffle. VET Baffles are simply wrapped in a less expensive skin. Sail Cloth Baffles are wrapped in a rip-stop nylon with a sewn edge, while VET Baffles are wrapped in a PVC skin and also come with a sewn edge. The goal with sound baffle placement is to stagger their direction, forcing the baffles to point in different directions much like a checkerboard pattern or a herringbone pattern. The goal is to maximize the ability to capture first wave sound reflections. 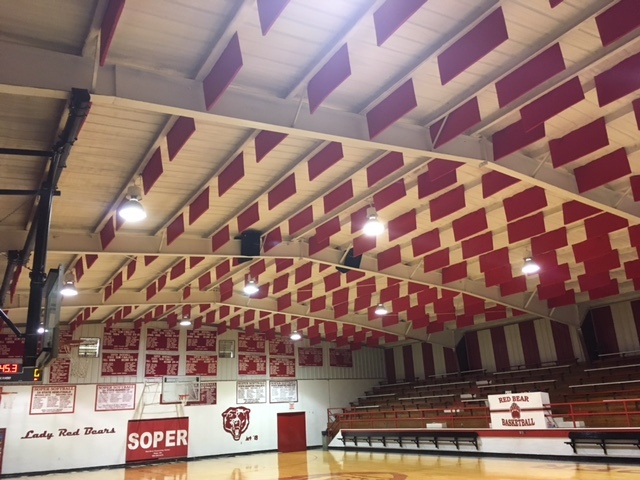 Be sure to visit our Case Studies library where we showcase a variety of recent sound baffle projects for ideas on your upcoming soundproofing project. This product is class A fire rated and approved for use in any public venue. 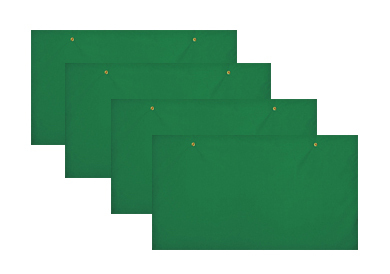 Sail Cloth Baffles are boxed and shrunk wrap on pallets that load onto a freight truck to deliver to your doorstep. Be sure to check for any damage to the order that may have occurred in transit. Once the baffles are delivered, carefully unpack them and inspect your order. Our popular Room Analysis is complimentary. This innovative tool is will define the quantities required for your treatment and quote your project back. Sail Cloth Baffle projects are quoted out based on the size of your room. Use this form to communicate back to our help desk the dimensions of your space, and we will calculate your baffle count and quote your project back. Questions? Call to 1-800-638-9355. Thanks!